BC Athletics together with individual athletes and parents value the work and commitment of Coaches. Coaches are the backbone of athlete development. As a Coach Member of BC Athletics you are a valued leader in your club, school, university/college, community, region and province. The approval of the Parent/Guardian if the individual is under the age of consent. The age of consent in British Columbia is 19. A Criminal Records Check is required for all Coach Members. It is valid for four years and must be renewed prior the end of the 4th year. For Unattached Coaches – it must be on file with BC Athletics. BC Athletics Coach Members are required to be: In-Training (in the first 2 yrs of coaching if new to coaching), Trained or Certified in Athletics through the Athletics Canada NCCP Coaching Certification Program delivered through BC Athletics or other Athletics Cd Branches. Note: The Coach Training you take and/or aspire to should reflect the development level of the athletes you are coaching. 2nd Year – by the end of your 2nd year of Coaching you need to be Trained (having completed a Run Jump Throw Wheel course; or Athletics Sport, Club or the Road Running Instructor/Coach course; AND completed the Making Ethical Decisions (MED) Course. Does not apply to activities related to day to day business operations outside of coaching BC Athletics members. See membership link for the BC Athletics membership types of Competitive; Limited Competitive; Day of Event. A Criminal Records Check is required for all Coach Members of BC Athletics. BC Athletics Sport Safety/Acknowledgement of Risk – see Individual membership application form. An Athletics Coach/Run Leader/Instructor is critical to the long term development of an athlete. The impact on an athlete (competitive, recreational or beginner) is well known – Great Coaches Build Great Athletes. BC Athletics is committed to ensuring that every athlete has a fun, safe and positive environment in which to train and compete. Through Coaching Education and associated Policies, Programs and Acknowledgements BC Athletics works to ensure that exists both on and off the training and competitive fields of play. Ensure a Safe, Fun and Positive environment for the athletes you coach and others you associate with. Thank you very much for your commitment to Coaching. BC Athletics Board of Directors, Membership and Staff. BC Athletics organizes Coaching Education courses throughout the year. We would like to meet the needs of as many BC Coaches as possible. Please complete the form below. This information will assist us in setting up the courses in the areas of interest. BC Athletics would like to offer FastTrack Evaluation Days throughout the year. We would like to meet the needs of as many BC Coaches as possible. Please complete the form below to request an Evaluation Day. The city/region with the most evaluation requests will get the next Fast Track Evaluation Day! (Proposed for January 2016). In order to be considered for team staff selection to a BC Team program, coaches must complete the online application form. Upon closing of the application period, coaches will be selected by BC Athletics, and contacted via email to confirm commitment to the selected team. BC Athletics offers a selection of publications related to rules, coaching, training and fitness. The following titles are available for purchase through the BC Athletics office. TO ORDER: click on the image beside the description and fill out our online ordering form. Please note that all entry data, including personal information and payment information, has been encrypted for your protection. Better Training for Distance Runners provides a prescription for success for today's competitive distance runners and their coaches. The book combines recent research, sound training principles, and proven program strategies to improve performance in events ranging from the 800-meters to the marathon. Authors Dr. David Martin and Peter Coe are the perfect team for translating lab findings to the road and running track. As one of the world`s foremost researchers on running, Martin regularly tests elite runners to identify their best strategies for staying healthy and improving fitness. Peter Coe, father and coach of 800- and 1000-meter world record holder Sebastian Coe, has long been regarded as a master of devising training plans that allow athletes to reach peak fitness when it counts most. Together, Martin and Coe present the most comprehensive and useful resource on the art and science of distance running—the formula that has produced many national championship, Olympic medal, and world record performances. 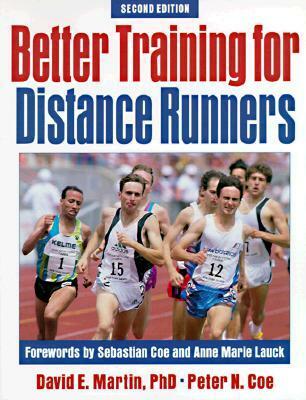 Better Training for Distance Runners builds upon the success of the first edition by providing loads of new information, such as the effects of altitude training and glycerin loading, the health problems experienced by women runners who may be too thin, and the best strategies for running road races and the steeplechase. It`s an essential guide and a great read for serious distance runners and coaches who desire to excel in future seasons and events. Ron Parker is a Canadian coach based in beautiful Victoria, British Columbia, the site of the 1984 Commonwealth Games. Ron is a former national champion in the decathlon and wrote the first edition of this book in 1976. He has coached since 1962. The purpose of Ron's book is: "This manual is for beginner coaches working with young athletes." Getting Started is a very attractive text. Glossed paper, colour photographs, diagrams and sequences of teenage athletes - an invaluable source of what teens look like as they master event techniques. This book provides the reality of developing athletes and provides exceptional insights into throws were Parker has provided several sequences. Essential in every coach’s track bag is the most recent IAAF-approved Competition Rule Book for the 2018-2019 season. With a foreword by IAAF President Seb Coe, this pocket-sized guide includes the official rules for International Competition, Eligibility, Anti-Doping and Medical Rules, Disputes and Disciplinary Proceedings, and Technical Rules for both stadia (Indoor and Outdoor Track & Field) and non-stadia events (Cross Country, Race Walking, Trail and Road races). Twenty-six runners ranging in age from 46 to 76 share their secrets, motivations and experiences in the fields of running. All are active runners and many presently hold world age-class records. Some have held world records and have achieved world level performances at the Olympics, Commonwealth and European games. But, Running in the Zone isn’t about super achievement, it is about getting the most out the running experience regardless of age or even ability. 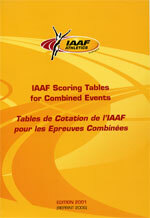 IAAF Scoring Tables for Combined Events (2001 Edition) now includes the events needed to score the women's decathlon (as directed by the 2001 Edmonton Congress). The book also includes a brief history of combined events competition (pentathlon, decathlon, heptathlon), an account of the evolution of the tables, rules, how to score, and of course full scoring tables for outdoor and indoor combined events competitions (60m, 60mH, 1000m), men and women. From the basic biomechanics of throwing to in-depth information on the discus, javelin, hammer, and shot put, Complete Book of Throws brings it all together to improve your techniques—and your distance! Complete Book of Throws takes the techniques and conditioning programs of the most accomplished coaches in each event and presents them in a way that athletes can understand and coaches can adapt to create a winning program. Whether you're just starting out in the event or preparing your team for competition at the highest level, you'll find the conditioning and training specifics you need to strength your body, improve your form, and push your performance to the edge. Four-time Olympian and six-time discus world-record holder Jay Silvester covers specific strength training and conditioning techniques, including training for athletes in multiple throwing events. World-class coaches complete the picture with in-depth coverage of each throw technique. Sport-specific strength conditioning, periodization, and effective energy transfer are all covered in this practical guide, along with detailed illustrations that walk you through every phase of each throw. In addition to serving as the Olympic throws coach for Team USA 2000, Silvester has coached five NCAA discus champions. Now he leads a team of top-notch coaches in creating the ultimate resource for athletes and coaches alike. If you are seeking to enhance your coaching technique, refine your athletes' technique, or improve their throws, the Complete Book of Throws has the details and instructions you need. Race your best this season with science-based training specifically geared for teenage runners. Your performance will soar when you follow the proven guidelines on designing customized daily, weekly, and seasonal programs. Running experts Larry Greene and Russ Pate combine the latest research with what works in the most successful high school and college programs throughout the country. You'll learn how to optimize performance through tempo running, interval training, technique drills, circuit and weight training, and flexibility exercises. And you'll gain a competitive advantage by applying guidelines for choosing the best foods and nutritional supplements, developing mental fitness, and preventing injuries. Training for Young Distance Runners has everything you need to build a winning training program for cross country, track and field, and road racing events. Get this book and get ahead of the pack! In this collection of profiles, 30 top Canadian runners (13 women and 17 men) discuss their successes and setbacks, their motivation, their training, and their races. Twelve of these runners are Olympians, six are Commonwealth Games medallists, and twenty-four have been national champions. John Cobley has been editor of BC Athletics Record since 1987. A runner himself for the past 36 years, he competed for Brighton and Hove AC in England and for BYU in the USA. He now runs for pleasure and fitness. John has been publishing articles on running since 1966. He makes his home in Victoria, BC, where he works as a consultant, tutor and instructor in business writing. This book presents the world's top track and field coaches. This is the world's top track and field resource. Long jump, triple jump, high jump and pole vault. From techniques and training to strategy and mental preparation, "Winning Jumps and Pole Vault" is the only book that covers it all. Renowned coach Ed Jacoby and the all-star line-up of Cliff Rovelto, Tom and Kyle Tellez, Irving Boo Schexnayder, Greg Hull, Will Freeman, and Keith Henschen share the secrets and strategies that have produced 62 NCAA champions, 15 Olympic gold medalists, and numerous other U.S. and world medalists and champions. Every phase of every event - from approach to takeoff to landing - is described to convey proper technique. Learn how to recognize and correct common technical flaws and rely on over 25 event-specific drills to perfect technique. With pre event preparation, conditioning programs, and jump and vault strategies, "Winning Jumps and Pole Vault" is the one resource track and field coaches and athletes can't afford to be without. iPerformance Psychology is the world’s most advanced sport and performance psychology app. This app is a standalone utility for training athletes to help them reach their peak performance levels. Using a combination of tried and true sport and performance psychology assessments, meditations, exercises, worksheets, games, routines, and more, the iPerformance Sport & Performance Psychology Mental Skills Trainer acts as personal advisor and trainer for those wishing to improve their mental preparation and focus for sporting events. Coaches of BC has developed a unique solution to provide coaches with access to the highest quality of education and development through a Performance Analaysis Toolkit. The tool kit will contain portable technology and iPads loaded with the most up-to-date software. Go Pro Camera - A water proof, shock proof camera that you can secure to your athletes body, helmet, ect to record a first hand view of what your athlete experiences. Swivl Cam and athlete sensor - This device requires you to attach the sensor to the athlete you wish to record and then uses your IPad to video tape. iPad (4th Generation with Retina Display) with Griffin Survivor Case (a water proof, shock proof case that allows coaches to utilize the technology in all weather conditions). Loaded with Apps! Performance analysis, fitness, sport, nutrition and much more. For an exclusive list of all apps click here. Technology Tutorial Sessons. Tutorials available upon request, consisting of lessons on how to use the various App's as well as the equipment provided. All tutorials wil take place online via our Fuzemeeting software.